Ray Roberts traveled from Sydney, Australia to southern California to compete in the 71st annual Newport to Ensenada International Race held late last month. Roberts recently bought a 1986 vintage Frers-designed 50-footer named Airwaves and was thrilled to skipper the old IOR warhorse to fourth place in PHRF B class. Members of the Airwaves crew convinced Roberts to stay in the United States a while longer in order to compete in the Farr 40 North American Championship, being held May 10-13 off Long Beach. Tactician David Chapman and strategist Bobby Wilmot are both veterans of the Australian Farr 40 circuit while several other members of the crew have experience aboard the classic one-design. Roberts himself had previously chartered a Farr 40 to do a couple regattas in his home waters off Sydney. 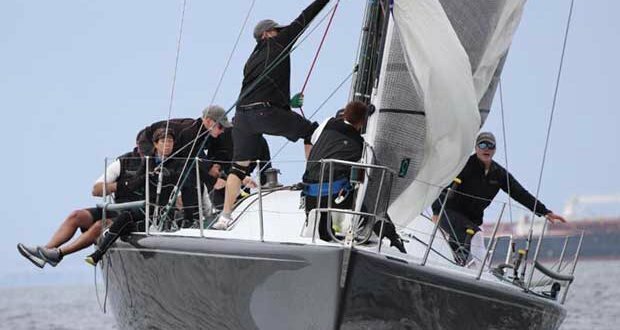 Roberts was the big story on the opening day of the Farr 40 North American Championship, sailing his chartered boat named Australian Temptress to second place overall following three races off Long Beach. Three-time world champion skipper Alex Roepers and his top-notch team on Plenty set the pace on Day 1 by winning two races and placing second in the other. Renowned professional Terry Hutchinson is calling tactics for Roepers, a New York City resident who captured the 2014 North American title. Roberts is showing that his Corinthian team is capable of giving Plenty a run for its money – placing second in Race 1 and 3 en route to posting nine points – five astern of the leader. Conditions were not typical for Long Beach at this time of the year with racing conducted in 6-10 knot winds from the south-southwest. Skippers and tacticians had to be heads-up as the shift was on the opposite side of the course than is usually the case. 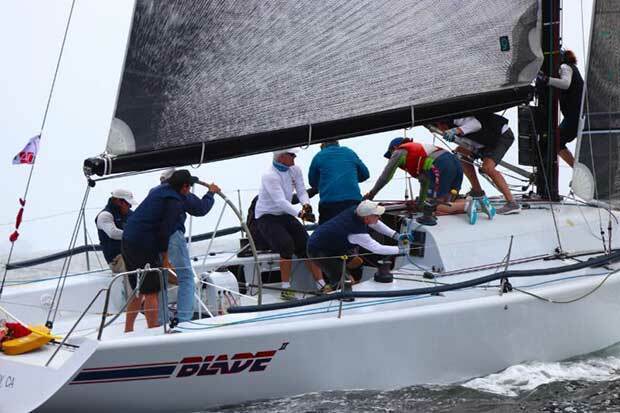 Australian Temptress missed a couple shifts in finishing fifth in the nine-boat fleet for Race 2, but Roberts felt his afterguard figured out the conditions quite well considering they are not real familiar with racing off Long Beach. Roberts has chartered a boat owned by Ray Godwin, who was runner-up among Corinthian entries at the 2015 Farr 40 Midwinter Championship held off San Diego. Meanwhile, Durant his chartering the boat he owned for four years with Jeff Shew. The Long Beach Yacht Club commodore showed he has not lost his touch on the tiller by leading Viva La Vida to a solid score line of 3-4-3 to close out Day 1 in third place in the overall standings, one point behind Roberts. “It felt good to be back aboard my old boat. It was kind of like riding a bike, but with one training wheel,” said Durant, admitting it will take more than one day of racing to re-acclimate to the Farr 40. John Carpenter, co-owner with Durant of a legendary Sparkman & Stephens 67-footer named Chubasco, is also doing some driving of Viva La Vida for the Farr 40 North Americans. Ernie Richau is aboard as tactician while Durant also had several members of his former Farr 40 crew. Durant said the Long Beach Yacht Club is “proud and honored” to host the Farr 40 North American Championship and praised the caliber of competition as well as the quality of sailors involved. Competition continues through Sunday off Long Beach with a new North American champ certain to be crowned as Flash Gordon, the winner the last three years, has elected to remain in Chicago to prepare for the 2018 Farr 40 World Championship that is being held off the Windy City in October.